Stephen Tobolowsky is an actor and writer. He also hosts the podcast The Tobolowsky Files. 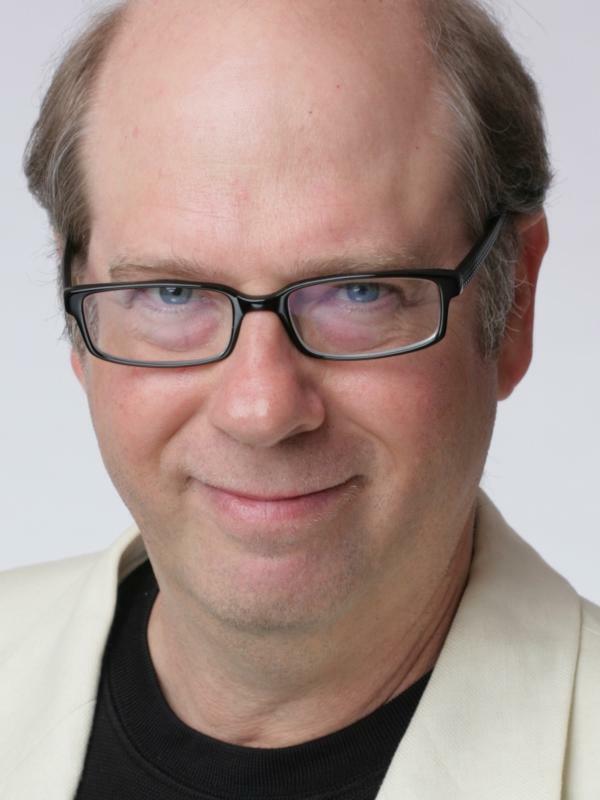 If you saw Stephen Tobolowsky on the street, you might think you know him from somewhere. The character actor has appeared in over 100 films and TV shows, with recurring roles in Heroes, Deadwood, Glee and now The Mindy Project. In his memoir, The Dangerous Animals Club, Toboloswky charts the highs and lows of life as a character actor. Some of his roles have been so small, he says, his characters didn't even have names — as, for example, with his turn as "Buttcrack Plumber." "I was happy to get that part — except when the costumer said, 'All right, Stephen, could you get down on all fours, please?' " he tells Fresh Air's Dave Davies. "And I got down on all fours, and he says, 'I don't really see a lot of crack there. Uh, Stephen, could you scooch around a little? We're not getting much crack.' "
Tobolowsky says the problem with playing some of these roles is the characters are "so low on the totem pole, that sometimes you're mistaken for the cleaning staff, and people try to chase you off the set when you show up to work." Over the years, he's developed a few theories for the kinds of names smaller characters get in scripts. While someone like Harrison Ford gets two names like Han Solo, the less important characters usually only get one name. In comedies, "you get your job description and your first name — like in Wild Hogs, I played Sheriff Charley" — and in dramas, "You get the job description and your last name — Detective McClaren, Agent Jones." Tobolowsky says it's not easy being a character actor. With leading actors and actresses, "everything they do is in the script — their entire day. You see them drinking coffee." Smaller roles should ideally have a through-line to their day as well, but character actors have to do that creative work outside of the script. Tobolowsky's approach is to ask two questions: What is his greatest hope? What is his greatest fear? Even though he usually doesn't have a lot of time to study his part, "the two questions will form a tightrope upon which almost any other question in the script can be answered." "The producers of the movie we were working on in Paris — for the sake of economy — put me up with the man who was playing my brother in the movie. His name is Kurt Fuller, and I asked Kurt ... what we were doing, what was next up on our lives. And Kurt said, oh, he was playing the part of Ned Ryerson in a new movie, Groundhog Day, with Bill Murray. The part was written especially for him. I'm listening to this — put in the picture of someone's brain exploding. I had no idea what to do. I knew I couldn't tell Kurt that I had just auditioned for the part that he had been given. In fact, Kurt said that he had already had a reading with the entire cast. "Well ... I ended up getting the part. Well, the premiere of Groundhog Day, I was there, and who was there waiting for me in the lobby was Kurt Fuller. Kurt hugged me, and he said, 'Well man, you got my part but at least you did it well — good work.' And I have to say, out of all of my experiences in Hollywood, that experience of Kurt coming to me and congratulating me at that particular time was setting the bar very high in terms of class and in terms of courage, and it's something that I've always endeavored to aim for, to be like Kurt." "The scene wasn't really scripted, and the producers said, 'Well, what are you guys going to do?' And I said to Kathy, 'Should we just do it the way it's really done?' And she said, 'Yes, Stephen — let's really do it the way it really happens in real life.' So the producers are saying, 'Guys, guys, please, please.' I said, 'No, no, no, you're dealing with professionals here.' So we got a bowl of Doritos, some dip, I got a TV changer, and Kathy and I just lay in bed and ate dip and were flipping channels through the TV going, 'Baby, that was great.' So we just watched TV and ate guacamole dip." "This is true with a lot of things in acting. You need to ask questions, and you need to ask the right questions. Alan asked me how I saw the man, and I said, 'I saw him as Abraham Lincoln — I don't see him as a villain. This man is a hero with his agenda, with his point of view.' I did not intend to play Clayton Townley as one chromosome short of a human being, like a lot of people will play various villains in movies ... In real life, everyone kind of sees themselves as the good guy, doing what they're doing. They see themselves as a kind of hero, and I wanted to make sure Clayton Townley ... wasn't played as some kind of genetic miscreant." "Well, I guess I fell in love with music when I was in second grade. It was on Talent Day, and a girl in our class, Claire Richards, played the piano, and she played 'Pickin' Up Paw Paws' with such verve and such joy, I knew I wanted to be a musician at that point in time. And I learned over the next few years — I took piano lessons — that I was not that good ... That I had the talent maybe to sound like I played the piano, but I did not have the talent Claire did to elevate music to something that could transform the audience, that could elevate them to another level. "I jumped up and picked up the music and turned it toward the audience and said, 'No, no, no — it's part of the piece. See, right here it says, 'Pianist falls off bench.' And they all start laughing, and I said, 'Now I continue.' And I went down, and I started playing the piano again, and I realized while I was playing, I did just now what Claire was always able to do. First of all, I filled the audience with terror. Then I filled them with delight. And then I filled them with release and relief and elevated them. I did have talent — just not with music. And right after that, I auditioned for my first play, which was a comedy." This is FRESH AIR. I'm Terry Gross. You may not know Stephen Tobolowsky's name, but if you saw one of his appearances in his dozens of movies, you'd probably say: Oh yeah, that guy. Tobolowsky is a character actor who's appeared in more than 100 films and TV shows, including several recurring roles. He was the former choir director Sandy Ryerson on the Fox series "Glee," Hugo Jarry on HBO's "Deadwood," he plays Stu Beggs on the Showtime series "Californication" and plays Marc Shulman in Mindy Kaling's new series "The Mindy Project." Tobolowsky has written a very funny memoir about his life and career called "The Dangerous Animals Club." He spoke with FRESH AIR contributor Dave Davies. They started with the role Stephen Tobolowsky's probably known for. In the film "Groundhog Day," he was Bill Murray's annoying high school friend Ned Ryerson. STEPHEN TOBOLOWSKY: (As Ned) Phil? Hey, Phil? Phil Connors? Phil Connors, I thought that was you. BILL MURRAY: (As Phil) Hi, how are you doing. Thanks for watching. TOBOLOWSKY: (As Ned) Hey, hey, now don't you tell me you don't remember me because I sure as heckfire remember you. MURRAY: (As Phil) Not a chance. TOBOLOWSKY: (As Ned) Ned Ryerson. Needle-nose Ned, Ned the Head, come on, buddy, Case Western High. Ned Ryerson, I did the whistling bellybutton trick at the high school talent show. Bing, Ned Ryerson, got the shingles real bad senior year, almost didn't graduate. Bing again, Ned Ryerson I dated your sister Mary Pat a couple times until you told me not to anymore. Well? MURRAY: (As Phil) Ned Ryerson? MURRAY: (As Phil) Bing. So did you turn pro with that bellybutton thing, Ned, or what? TOBOLOWSKY: (As Ned) No, Phil, I sell insurance. MURRAY: (As Phil) What a shock. TOBOLOWSKY: (As Ned) Do you have life insurance? Because if you do, you could always use a little more. Am I right, or am I right, or am I right, right, right? Well, Stephen Tobolowsky, welcome to FRESH AIR. Good to have you, and I think there are probably Americans who know the name Ned Ryerson who can't name the vice president. DAVIES: Tell - how'd you get that role? TOBOLOWSKY: Oh dear, Dave, that's a terrifying story. I was working in Perris, California. I often say just Perris to make people think I live like John Travolta. But I was in Perris, California. I was doing a movie there, and I got an audition for this show "Groundhog Day." I went in to audition, and I decided I'd play it big, and I actually read with Harold Ramis, the director. I mean, he read with me, which was a shock. I drove back to Perris and found out I got a callback for the part. The producers of the movie we were working on in Perris for the sake of economy put me up with the man who was playing my brother in the movie, his name was Kurt Fuller, and I asked Kurt, we were roomed together, what we were doing next up, what was next up on our lives. And Kurt said oh, he was playing the part of Ned Ryerson in a new movie "Groundhog Day" with Bill Murray. The part was written especially for him. I'm listening to this, put in the picture of someone's brain exploding. I had no idea what to do. I knew I couldn't tell Kurt that I had just auditioned for the part that he had been given. In fact, Kurt said that he had already had a reading with the entire cast. Well, I went back, I auditioned, I ended up getting the part. The premiere of "Groundhog Day," I was there, and who was there waiting for me in the lobby - was Kurt Fuller. Kurt hugged me, and he said: Well, man, you got my part, but at least you did it well. Good work. And I have to say out of all my experiences in Hollywood, that experience of Kurt coming to me and congratulating me at that particular time was setting the bar very high in terms of class and in terms of courage, and it's something that I've always endeavored to aim for, to be like Kurt. DAVIES: Your memoir, "The Dangerous Animal's Club," is both a personal and a professional recounting of your life. And I wanted you to read a section. This is where you're talking about the life of character actors, the people who work but have to keep hustling for work. And you remember a friend of yours. Will you just read this section here on Page 20? TOBOLOWSKY: Right, I was citing that one of the unusual things about me in my life is that I'm an actor but not only an actor but an actor who actually works in show business, which is even more unusual because you can never be too sure when an actor says they're working what they mean. Case in point, in 1972, my girlfriend Beth and I did summer stock in New York. We were doing a production of "Midsummer Night's Dream" when Jack, who shall remain nameless, left our company because he had gotten a job on Broadway in "Pippin." So we had a big goodbye celebration for him, and he said next time we were in the city, we should see the show and come back to the stage door afterwards and say hello. Well, we took him up on the offer a couple months later. Beth and I went to "Pippin," but Jack, Jack was nowhere to be seen. We went to the stage door and asked for him. The guard called back for Jack. He showed up wearing elbow-length black rubber gloves. I told him I enjoyed the show but missed seeing him onstage. I asked if he was in the chorus; Beth asked if he was disguised as a mushroom or a tree. Jack was not amused. He said he never claimed he was in the show. He said he worked on the show. He was in charge of giving enemas to the animals that appeared onstage so they wouldn't have an accident during a musical number and horrify the audience. TOBOLOWSKY: Pause. Now there have been very few times in my life when I have been speechless. In this case it was the combination of horror, surprise and curiosity as to how much the job paid and if they offered it to me, would I take it. Now Jack was rightfully offended by whatever look we had on our faces, but we hit us with the now classic rejoinder: Hey, at least I'm on Broadway. But Jack and his rubber gloves taught me never to trust an actor when they say they're working. DAVIES: That is our guest, character actor Stephen Tobolowsky, from his new memoir "The Dangerous Animal's Club." You write a lot in this book about some of the parts you've had, and auditioning is a part of your life, and I don't suppose Dustin Hoffman has to audition that much, but you generally do, right? DAVIES: And you write that there's - you know, you can - you don't always get a lot of information about the part sometimes. TOBOLOWSKY: Right, right, yeah, we have audition a lot of times, and we audition in terrible situations. I remember there was one audition I had, and I get a phone call from my agent, who handles commercials, and said: Stephen, we have an audition for you for a commercial. I said: Well, you know I don't do that stuff. She said: Well, this could be a seven-figure job. That is enough for me to make a U-turn over my priorities. I drove over to the casting office, and there in the room was every bald-headed, middle-aged guy I had ever known in Hollywood, and they're all lined up around the room sound asleep. So I figured they'd been here for hours and hours. Well, a lot of times for commercial auditions you don't get a script ahead of time, and sometimes there is no script at all, and they want you to improvise, and they give you what they call a storyboard. So I'm looking at the storyboard. The storyboard is about a family going to Universal Orlando vacation site, a little boy looking out the window, and the mother and father are asleep. They're asleep. TOBOLOWSKY: That's my role, the father asleep. Now I realize that all these guys in the room, they're practicing. They're practicing their improv. DAVIES: Now you say there's a pecking order of roles, and you can tell by whether the characters have a first name or a last name or any name. TOBOLOWSKY: Oh dear, yes, yes. I found that when you read a script, you know how much time the writer has given thinking about a role by whether you have a name or not. Now people like Harrison Ford and Johnny Depp, they get two names, you know, Han Solo, Captain Jack Sparrow - he even has a title, you know, captain. But the ranking roles below that, you usually only get one name. If it's a comedy - now, this is not a hard-and-fast rule, but I've kind of found it to be true. If it's a comedy, you get your job description and your first name, like in "Wild Hogs" I played Sheriff Charlie. I played Ringmaster Bob, a lot of roles in which you get the job and your name. If you are playing a serious role, you get the job description and your last name, Detective McClaren, Agent Jones. Now, then there's a level below that, in which you get no name, you get no name. You just get your - sometimes your job description - homeless man, man on train, man with a limp. You get these. These are usually not very good roles. I think once I got the role of buttcrack plumber. TOBOLOWSKY: And believe me, I was - don't laugh, I was happy to get that part except when the costumer said: All right, Stephen, could you get down on all fours, please? And I got down on all fours. He says: I don't really see a lot of crack there. No, no, neither do I. But there is, Dave, there's a level below buttcrack plumber if you can believe that, and that is when you get the kind of job description and a number like buttcrack plumber 2, homeless man 3, government man 4. And I've played all the - I've played all these parts, too. What made this particularly painful was that the director Rob Heydon called me up on the phone and said: Stephen, I've just written a part for you in my new film. So I was really excited, and then he sends me the script, and I open it up, and it says you're on Page 62, and it's buttcrack plumber. So he wrote that part with me in mind. DAVIES: And it all worked out. You figured out what your motivation was and gave a great performance? TOBOLOWSKY: I did that scene actually with the great Kathy Bates. I had several scenes with Kathy Bates, including one of the few bed scenes with Kathy Bates and I in the sack together. The scene wasn't really scripted, and the producers said, well, what are you guys going to do? And I said to Kathy, I said: Shall we just do it the way it's really done? And she said: Yes, Stephen, let's really do it the way it really happens in real life. So the producers are saying guys, guys, please, please. I said no, no, no, no, you're dealing with professionals here. So we got a bowl of Doritos, some dip, I got a TV changer, and Kathy and I just lay in bed and ate dip and were flipping channels through the TV and going: Baby, that was great. DAVIES: And that made it into the film? TOBOLOWSKY: You know, I haven't seen that. I haven't seen the film. TOBOLOWSKY: You know, I can't, I can't - Dave, I don't have time to see everything I've been in, but I've heard it's quite a delightful film. DAVIES: And the name of the film is? TOBOLOWSKY: "You Must Not Kiss the Bride." DAVIES: "You Must Not Kiss the Bride," all right. In the book you describe being in the series "Heroes" and how difficult it was to figure out who your character was, whether it was a good guy or a bad guy. TOBOLOWSKY: Oh help me, yeah, it's just a nightmare. And I don't think the writers knew who I was. I certainly know the producers don't. Allan Arkush was one of our producers, a terrific director, terrific writer and producer. But I asked Allan who I was - playing Bob Bishop the man who could turn things into gold - who I actually was because they wouldn't show me a script because it was all so top secret. If you recall at that time, "Heroes" was such a sensational show. People were looking for little bits of anything to post on the Internet to be spoilers. So they wouldn't show even the actors the scripts. So Allan said, well, imagine that you're a good guy who's really a bad guy who's pretending to be a good who in actuality is a bad guy who may make a final turn to be a good guy. And the sad thing is, he wasn't kidding. TOBOLOWSKY: I had no idea week to week to week who I was in that show until they - I knew they were going to kill me. I knew they were going to kill me, and I had done nine shows. I still didn't have a chair with my name on it. And when I asked for my chair, they gave me a metal folding chair, put a piece of duct tape on the back of it and with magic marker wrote cast. So I felt like that was probably near the end of the line for me. And Tim, the executive producer of the show, called me up later that week and said Stephen, we're going to kill you in the upcoming show. I said: Tim, well, I knew it was going to come sooner or later when I saw the chair with the duct tape. And said: Well, Stephen, it's going to be sooner. DAVIES: We're speaking with Stephen Tobolowsky. His new memoir is called "The Dangerous Animal's Club." We'll talk more after a break. This is FRESH AIR. DAVIES: If you're just joining us, our guest is actor Stephen Tobolowsky. He has a new memoir called "The Dangerous Animal's Club." You're known for a lot of comedic roles, but you say that one of your big breaks came in the movie "Mississippi Burning," where it was a serious role as a Ku Klux Klan leader. How'd you get that part? TOBOLOWSKY: I remember it was a really traumatic period in my life. I was - personally I was at one of the lowest ebbs of my life. My relationship with my girlfriend of years and years and years was coming to an end, and out of nowhere, you know how they say God closes a door and open a window? Suddenly I get the biggest career break in my life, a meeting with Alan Parker from "Mississippi Burning." Well, I was so miserable for my first audition, I didn't even know what I was doing. I went in the room, I looked out the window, there was a golf course. Alan was filming me. I went through my speech as Clayton Townley, the head of the Ku Klux Klan. I left the office, got a callback from my agent: Oh, they want to see you again. I went back, I did the same thing, got a callback saying they want to see you a third time. Now I was getting kind of nervous. Now I was going, like, my goodness whatever I'm doing I must be doing right of some sort. I went back to the office, and this time I was sitting there, and I was fretting a little bit. The secretary looked over and saw me nervous, and she said: You know, Stephen, they like you a lot in there. A lot of people have been reading this part, and they keep trying to be scary, but Alan thinks you're scary just as you are. DAVIES: You know, one of the interesting things that you note in the book about getting that role in the movie "Mississippi Burning" is that you saw the guy as - that he saw himself as a good guy, like Abraham Lincoln, and that worked. TOBOLOWSKY: Well, this is true with a lot of things in acting. You need to ask questions, and you need to ask the right questions. Alan asked me how I saw the man, and I said I saw him as Abraham Lincoln. I don't see him as a villain. This man is a hero with his agenda, with his point of view. I did not intend to play Clayton Townley as one chromosome short of a human being like a lot of people will play various villains in movies. No one usually - except in James Bond movies. OK, in James Bond movies, villains see themselves as villains, but in real life, everybody kind of sees himself as a good guy doing what they're doing. They see themselves as a kind of hero, and I wanted to make sure that Clayton Townley had the kind of size and heroism and wasn't played as some sort of genetic miscreant. DAVIES: You know, when - my son, I spoke to him last night. When I told him I was interviewing Stephen Tobolowsky, he said, oh, yeah, I know who he is. And he remembered your role in "Spaceballs," the Mel Brooks film. DAVIES: And it was - he said it was a quick part where it's the big chase scene at the end where the princess is running around a spaceship, and then you realize that your men - you are some commander - and you say something like: Oh, you idiots, you've captured their stunt doubles. And so the woman turns around, and she's a guy with a moustache and all. And it struck me that, you know you get - some of these parts are longer and deeper and recurring roles, but some of them are pretty quick. And I know that you've done a lot of theater where you are the lead, I mean, you're in an Ibsen play, and you're carrying the theater for three hours. And when you do that, you really know what the character is. Is it harder to get a script where you've got a small part and figure out the character? TOBOLOWSKY: Oh, it's one of the real challenges. It's what people don't expect as a difficulty of being a character actor. When you go back to the roles that have two names - Harrison Ford, Johnny Depp, those guys - everything they do is in the script, their entire day. You see them drinking coffee, you see them taking a shower sometimes. Their entire throughline is in the script. If you play their buddy, or worse the plumber of their buddy, you have a day, too, and you have a throughline to your day, too, but you have to do that work outside of the script. If - I know a lot of actors listen to this show, and I want to bring this up. One of the quick ways I use as a character actor to get into any part is I ask two questions: What is my greatest hope? What is my greatest fear? And usually you don't have a lot of time as an actor to study your part, but if you can answer those two questions, they will form a tightrope upon which almost any other question in the script can be answered, and those are the two I go for. Yeah, that is the work of being a character actor, doing that work off-camera. DAVIES: And when you do it well, it shows. People remember you, and you get more jobs, I assume. TOBOLOWSKY: Well, you do, and - or at least you don't get cut out of the movie. GROSS: Dave Davies will continue his interview with actor Stephen Tobolowsky in the second half of the show. Tobolowsky's new memoir is called "The Dangerous Animal's Club." I'm Terry Gross, and this is FRESH AIR. GROSS: This is FRESH AIR. I'm Terry Gross. Let's get back to the interview FRESH AIR contributor Dave Davies recorded with character actor Stephen Tobolowsky. He has a new memoir called "The Dangerous Animals Club." Tobolowsky has been in over 100 movies and TV series, including recurring roles in "Heroes," "Deadwood," "Glee," "Californication" and Mindy Kaling's new series "The Mindy Project." TOBOLOWSKY: Yes. Hugo Jarry, the commissioner. Yes. DAVIES: Kind of a corrupt political operative, would you say? TOBOLOWSKY: I would say amoral. I would say amoral. He would - he went wherever the money was greenest. DAVIES: They built the town and there were all these horses and extras and all of this stuff. And you tell a couple of remarkable stories. I mean there was the one of the shoot in the rain where you go when the saloon. You know what I'm talking about? TOBOLOWSKY: Yes. Yes. Absolutely. You're right "Deadwood" was the most mammoth production I've ever been a part of. In fact, and we had the top flight guys from all over Hollywood. We had the same camera crews that worked on "Mississippi Burning." I mean we had the top people working on "Deadwood." We not only built the town but we had an area where we kept livestock to have stampedes and cattle and wagons, we had hundreds of extras. But we shot under any and all conditions, and there were torrential rains happening in Los Angeles at that time. And my job in the scene was to come in from outside the street, through the barroom doors up to the bar to meet with Powers Booth and Garrett, to do a little bit of diabolical planning of what we were going to do - some chicanery. Well, there were always last-second improvisations that David Milch, the producer of that show, threw at us all the time. So you never really knew what a scene was going to turn out to be. So I was coming from outside in the rain, in this torrential rain, coming in. One of the extras on horseback was behind me. And one of the horses just said, I give up, I've had enough. So the horse ends up coming in behind me also. I walk up to the bar. The horse walks up to the bar. TOBOLOWSKY: Powers starts talking and he thinks the horse being at the bar was the last second edition by David Milch. So Powers is planning all this evil we're going to do and he includes the horse as to what you're going to do. TOBOLOWSKY: OK. I want you to go over this - and then after they called cut, Powers came up to me. He says, was the worst is added to the scene Tobo? And I said no, Powers. No. But I think that will be in the blooper reel that we'll see at the end of the year. TOBOLOWSKY: Just sick of the rain. Came in - and, of course, on "Deadwood" nobody knew. Nobody knew if it was something that David, out of his madness, said let's bring a horse into the bar. So, you know, we just shot everything. No one ever called cut. We just, I mean there was one scene where Tim Oliphant, I've been taken to - I got taken to jail a lot in that show. Tim Oliphant is taking me to jail and David Milch thought the street looked awfully empty so he put a gigantic yoked bull in front of us and Tim and I are supposed to walk and talk and do our scenes. And right in the middle of the scene the bull lifts his tail and does what bulls do in the middle of the street, except he did it all over my pants legs and my shoes. So I was squishing when I was walking. We called - they called cut at the end of the scene. Tim Oliphant starts busting a gut laughing. I start complaining that the bull had a pooh-pooh on me. And David Milch was saying you can't pay a bull to do something like that. It was perfect. And he did it right on cue. It's a print. It's perfect. And as I'm grumbling, walking back to my trailer, David says and Stephen, remember, we don't wash our clothes on "Deadwood" because we want the stains to be consistent week in and week out. And he was right. They never, never washed my pants. They never cleaned my shoes and that bull gave me a gift that kept on giving for months afterwards. DAVIES: I wanted to talk about your role in "Glee." DAVIES: Sandy Ryerson. It was in the first few episodes. Is it a coincidence that this was another Ryerson, like Ned Ryerson? TOBOLOWSKY: Well, you know, I never had the nerve to ask the producers. It's spelled exactly the same as Ned Ryerson, so maybe they wanted it to be a callback or an homage to Ned. Maybe Ryan Murphy loved "Groundhog Day" beforehand. I just didn't want to jinx it by saying anything. I remember when I read for that. It was an interesting moment because I had just broken my neck. I had broken her neck three months before and the doctor said it was a fatal injury, which I thought was a terrible misuse of the word fatal, you know. TOBOLOWSKY: I mean you don't tell a patient that, you know, son, you have a fatal injury. It means dead, you know, but I wasn't dead. Through a miracle of anatomy I ended up alive. I broke five vertebrae in my neck, but after three months or so I would be fine. TOBOLOWSKY: Oh, dear. Well, it's all miserable and horrible. I went horseback riding with my wife, Ann. And we were riding in Iceland and we were on a riding little party on the side of an active volcano. And go figure, it turned out to be dangerous. And while I'm riding, a gigantic wind came - and Iceland is noted for big winds - and lifted me and the horse - and the horse - off the ground, lifted us up and threw us onto the other side of the road. The horse I guess took this as God's way of saying gitty up, and he took off with me dangling off of the saddle, and apparently he threw me on the other side of the mountain onto a hardened lava flow. And I say apparently, because this is the stuff of legend, because when I hit I lost all kind of consciousness, even though I was awake. Apparently, the head of the riding troop ran over, saw me on the ground in a fetal position in the middle of this lava flow on the one piece of soft vegetation in the middle of all this hard rock. Apparently, I stood up, jumped on another horse and said let's go. Oh, wait a minute, I feel a little sick. He said well, maybe you were hurt from the fall. I said what fall? He said get off of the horse. DAVIES: Let's listen to a scene from "Glee." This is in the first episode where you're the guy who used to run the glee club and you're in this sort of bed and bath store, and you run into the teacher who now runs the glee club. That's Will Schuester. He's played by Matthew Morrison. Do you want to just say just a little bit about who your character is before we listen to this? TOBOLOWSKY: Yeah. Sandy Ryerson, as you said, was the head of - he had something like 30 complaints against him of him incidentally touching various members of the glee clubs beforehand, so he was destined to be fired soon anyway. I think that's enough. DAVIES: Well, let's listen when he's here and we hear him initially talking to one of the clerks at the bed and bath store. TOBOLOWSKY: (as Sandy Ryerson) Of course, towels have a thread count, Mr. Sheets and Things. What do you do? I read catalogs. I know these things. Anything under a 400 thread count and I can break out in impetigo. It's simple to understand. William? MATTHEW MORRISON: (as Will Schuester) Sandy? Hey. TOBOLOWSKY: (as Sandy Ryerson) Well, hello. How are things? I hear you have taken over glee club. MORRISON: (as Will Schuester) Yeah. I hope you're not too upset. TOBOLOWSKY: (as Sandy Ryerson) Are you kidding? Getting out of that swirling eddy of despair, best thing that ever happened to me. (as Sandy Ryerson) Don't get me wrong. It wasn't easy at first. Being dismissed, and for what I was accused of, my long-distance girlfriend in Cleveland nearly broke up with me. Took me weeks to get over my nervous breakdown. MORRISON: (as Will Schuester) Did they put you on medication. TOBOLOWSKY: (as Sandy Ryerson) Better. Medical marijuana. It's genius. I just tell my Dr. Feel Good I'm having trouble sleeping and he gives me all of it I want. I'm finding the whole system quite lucrative. MORRISON: (as Will Schuester) You're a drug dealer? TOBOLOWSKY: (as Sandy Ryerson) Oh, yeah. Make five times more than when I was a teacher. I keep some for myself and then I take money baths in the rest. That scene was completely improvised with the clerk. That was - we improvised a lot on "Glee." And Ryan and the writers came up with great things to throw at me and say can you work this in? And that was one of the most fun shows I ever worked on. DAVIES: You want to tell the story of how you discovered comedy at a piano recital? TOBOLOWSKY: Well, I guess I fell in love with music when I was in second grade. It was in talent day, and a girl in our class, Claire Richards, played the piano, and she played "Pickin' Up Paw Paws" with such verve and such joy, I knew I wanted to be a musician at that point in time. And I learned over the next few years — I took piano lessons — that I was not that good. That talk about dream - the distance between the dream and what you want to defend - that I had the talent maybe to sound like I could play the piano, but I did not have the talent Claire did to elevate music to something that could transform the audience, that could elevate them to another level. I eventually got better and better and better at the piano. And one of my last recitals, I was playing a piece by Auguste Durand, a waltz in E-flat, which is a favorite recital piece - it has a lot of very familiar passages if you ever listen to the recording of it. Anyway, I sat down at the piano and the piece begins with three dramatic chords with arpeggios that go up, up the scale. But I played these three chords so well. And the arpeggios were perfect for once in my life. I decided on the spot, improvisationally, to add a fourth chord that would go even higher with an arpeggio that was even grander. And I ran out of keys and I fell off the end of the piano bench onto the floor. The audience was horrified. They were like, oh. I jumped up and picked up the music and turned it toward the audience and said, no, no, no - it's part of the piece. See, right here it says, pianist falls off bench. And they all start laughing and I said, now I continue. And I went down and I started playing the piano again and I realized while I was playing, I did just now what Claire was always able to do. I was able - first of all, I filled the audience with terror. Then I filled them with delight. And then I filled them with release and relief and elevated them. I did have talent - just not with music. And right after that, I auditioned for my first play, which was a comedy. DAVIES: Well, Stephen Tobolowsky, thanks so much for speaking with us. TOBOLOWSKY: My pleasure. Thank you so much, Dave. GROSS: Stephen Tobolowsky spoke with FRESH AIR contributor Dave Davies. Tobolowsky's new memoir is called "The Dangerous Animals Project." You can read an excerpt on our website FRESH AIR.npr.org. Coming up, Ken Tucker reviews the second album by the band Low Cut Connie. He loved their first one.